We must teach students how to talk about issues connected to living together in society—so they can learn from others and find their own voices. Since the new millennium, disagreement between people with different political perspectives has become entrenched—and often rancorous. With a broader range of media channels, people are choosing to listen to viewpoints similar to their own. Opportunities for conversation across political differences are shrinking. Learning how to talk about differing beliefs in such a way that one hears and learns from the other, therefore, is an increasingly important skill, especially within a diverse democracy. Unfortunately, schools are spending less time fostering democracy and civic engagement (Fitchett & Heafner, 2010) and more time focusing on test preparation. The accountability era presumes that knowledge and information is static and can be memorized, a view that could promote a monoculture while leaving out minority and diverse students' experiences (Paris, 2012). We believe it's more important than ever to teach young people skills for engaging in critical dialogue, both to learn from people with different beliefs and so that all students' voices (their stories, opinions, or feelings) are heard. We use the term dialogue to describe engaging in collaborative and generative consideration of how we want to live together (Serriere, Burroughs, & Mitra, 2017). This skill is vital for a functioning democracy. In addition to helping achieve consensus or agreement in class discussions, dialogue enables young people, with guidance from adults, to talk productively about issues related to living together in society. To engage in such dialogue as citizens, people must have opportunities to practice this skill from a young age. Practicing this kind of serious interaction within school helps students realize that, as citizens, they must discuss issues with one another often. It also helps students see that their actions not only impact themselves (and involve their rights), but also impact others (and involve responsibilities). Our use of the term dialogue is influenced by previous conceptions of this practice in the work of John Dewey (1938) and Paulo Freire (2003), among others. For Dewey, dialogue plays a vital role in motivating students' learning and educating them for citizenship in a democracy. It's not enough to simply tell children about democratic practice; they must live this experience, starting in school. For Freire, dialogue is fundamental to developing and acquiring knowledge, as opposed to traditional (and potentially oppressive) practices of indoctrination and passive learning. Knowledge and the learning process aren't static, but always in process through dialogue within the learning environment. For both these educators, and for us as practitioners and theorists, dialogue is a central element of a respectful education—and a practice that prepares students for political life. We view dialogue as critical for encouraging young people to examine their environment, question injustices, and take action to make things better. Good civic education not only develops skills, knowledge, and attitudes for future participation, but it also recognizes children as citizens in their own right, with knowledge about their current communities and the ability to make a difference in those communities (Osler & Starkey, 2005). Based on our research in schools that foster civic action and student voice, we believe having students engage in critical dialogue can improve civic engagement. We define critical dialogue as a process that combines the concepts of inquiry and student voice to make a difference in the world. This practice of critical dialogue should stretch from the preschool years through higher education. Young children are fully capable of thinking about ethical dilemmas (Serriere, Burroughs, & Mitra, 2017) and participating in decision-making processes (Dockett & Perry, 2005). Adults often question whether young children are able to consider the perspectives of others, but research demonstrates the emerging capacity for empathy and perspective taking in early childhood (Hoffman, 2001). With appropriate support, children can demonstrate rich potential to grow through dialogue with others; in fact, considering others' perspectives and values at a young age has been described as a "springboard" for developing empathy. We focus here on the concepts of student voice and "making a difference," providing examples from our school-based research of what effective critical dialogue looks like. The term student voice can refer to anything from the most basic level of youth sharing their opinions about problems and potential solutions, to young people collaborating with adults to address problems, to youth taking the lead on seeking change (Mitra, 2007). Some researchers use terms like youth-adult partnership and pupil participation to study similar concepts (McIntyre & Rudduck, 2007). All types of student voice activities, from limited input to substantial leadership, are considerably different from the roles students typically perform in schools (like planning school dances and holding pep rallies). We suggest that critical dialogue in schools should focus on fostering student voice and showing young people how to make a difference in both their own lives and the lives of others. Students can learn to participate in their community and push for changes when they observe injustices. For example, our research shows that using environmental stewardship as an ongoing theme throughout a school can lead to student-initiated activities, such as lunchroom composting, classroom recycling, and integrating environmental principles into the civics, math, science, and language arts curriculum (Mitra & Serriere, 2015). The concept of making a difference is a particular form of agency—a way in which young people can take individual or collective action toward improving issues of concern in a classroom, school, or community. Focusing on making a difference pushes against the individualistic tendencies of some civic education practices. It examines power relationships and people's responsibility to address injustices (Levinson, 2012), and considers who is able to participate, whose actions are considered worthy, and whose voices get heard. Focusing on making a difference within schools is rare, but when it's practiced, students often become re-engaged in and more attached to their schools (Mitra, 2008). Students speak about developing shared meaning making, exchanging perspectives, and working across differences (Mitra & Serriere, 2012). Critical Dialogue in Kindergarten: Should You Kill a Crook? Civic engagement is fundamentally about fostering the conditions for people to work, live, and make decisions together in a democracy. At Dewey Elementary School2 , educators foster civic engagement by encouraging dialogue in kindergarten classrooms. The school's principal formed a partnership with two local university representatives affiliated with the department of philosophy. She found she shared the belief with the two—a senior lecturer and a graduate student—that philosophical, civic, and ethical discussions should have a prominent place in early childhood education. Prior to these guest teachers leading book dialogues, students and teachers at Dewey had been engaging in weekly conversations on citizenship values such as "responsibility" and "cooperation." The partnership with philosophers extended this practice by adding facilitated discussions of philosophical and ethical concepts, additional forms of discussion prompts, and scaffolding student dialogue. Let's look in as the faculty member in this partnership, Michael Burroughs, sits in the "reading chair" of a kindergarten classroom at Dewey Elementary to introduce the book Hey, Little Ant by Phillip and Hannah Hoose (Tricycle Press, 1998). The book depicts an ant in danger of being stepped on by a young boy. The story suspends the deciding moment of whether the boy will step on the ant as the ant begs the boy not to kill him and gives reasons why he should be spared. In turn, the boy ponders the ant's guilt (the ant stole food from picnics) and the worth of its life. Burroughs leads the kindergartners in considering the right thing for the boy to do. Throughout the discussion, the kindergartners raise questions and ideas about additional aspects of the story and the ethical dilemmas it presents. For example, they discuss whether the ant is a "crook," which, in part, is why the boy is considering stepping on him. Burroughs asks, "Is it OK to kill a crook?" After some silence, he asks, "Who thinks the ant is doing something wrong?" Tim: (raising his hand) It's not nice to steal. Jack: You can't take food. That's stealing. Eric: I think it's in the middle because they have no food left. The ant is in the middle. There's stealing, but probably they don't have a lot of food. These children are exercising student voice at a basic level—sharing opinions on questions and problems. Eric's comment takes the discussion in a new direction, evaluating stealing in a complex way as somewhere between the opposites of "right" and "wrong." This helps the other students discover how complicated and nuanced ethical dilemmas are; more than one choice may be on offer and none of the choices may feel completely right. The ensuing discussion revealed the children's ethical awareness and ability to discern the complexity of ethical decisions and competing values (for example, compassion versus justice). Rather than focusing on a desired outcome or skill students are expected to master, this dialogue surfaced issues and tensions common to life in a diverse society. The children not only discussed those tensions, but grappled with larger societal issues such as retributive justice. These students also practiced perspective taking, both with one another and with characters in the book. Clearly, from a young age, children can reason in complex ways, consider others' perspectives, and recognize the potential for ambiguity in moral judgment. Critical Dialogue in Middle Schools: An Unfair Dress Code? Students at Delta Middle School in State College, Pennsylvania, engaged in an inquiry process called Youth Participatory Action Research in their social studies class. They learned how to identify problems or policy questions within the school that they wanted to explore, such as how to raise funds for 3–D printers, if students should be allowed to take school laptops home overnight, and whether students should have access to parts of school grounds during their free time. A student named Kaden wanted to tackle a problem with the school's dress code. Kaden's concern surfaced when a female teacher told a group of girls that they were in violation of the dress code. The teacher went further to give the opinion that the male teachers might be uncomfortable because of how the girls were dressing: "[This teacher told us] that there were too many male teachers and students to be wearing those particular outfits. Our straps were showing and it was too distracting." Far from being a dialogue, the teacher's exchange with the girls reflected an authority figure's assumption that the girls' bodies were distractions, rather than any consideration that the sexualization and objectification of young girls was part of the problem. Kaden's social studies teacher, Paul, helped all students in his class begin their inquiry projects by forming researchable questions and gathering data that would answer those questions. Each student built a "mini-theory" based on the data he or she had gathered. The class then deliberated each of these mini-theories, referring to the collected data. Kaden collected data from her school's student body and conducted interviews with students at her school and a magnet school in a neighboring state. One thing her data showed was that, in both schools, more boys than girls supported the idea of a stricter dress code. She shared with the class her mini-theory that more boys supported a strict dress code because the very nature of a such a code tends to impact girls more than boys. Kaden's data backed her hypothesis, and the class discussed possible implications of that data. Several girls picked up Kaden's point, expressing their thoughts that if a boy wears shorts or a t-shirt, [people] aren't concerned about how much skin he is showing. "Why are we subjected to this cultural issue that we didn't choose? We are just wearing clothes we are comfortable in," they asserted. Paul hung posters showing students' data and mini-theories in common areas of the school to encourage people to consider students' work and provide feedback. Kaden's data generated conversation and curiosity. I backed her up and said: "I'm a faculty presence here to advocate that she did this work. It's bonafide survey work and interview work. She vetted her survey questions with me. She vetted her interview questions with me. … This is legit work for a beginning middle schooler doing her own research. And what we think is that the policy disproportionally affects girls." I said it so our administrator heard it. During the discussion that followed, students and adults raised questions and concerns and deliberated potential policy changes based on Kaden's data. The issue of what kind of dress code is appropriate currently remains under consideration by that body and continues to be a topic of debate and controversy among students and staff. In this example, a student's questions and exercise of her voice led to a discussion by the governing body of the school. Kaden became motivated to make a difference. Reflecting on the year, she said, "I see myself as an activist because I want to change the dress code as it is, now." We recognize that encouraging such activities in schools can be controversial and difficult. We've found that the following conditions enable young people to participate in democratic practices like noticing and questioning injustices, developing critical questions, and examining how structures and norms might leave out some voices and privilege others. Slow down and foster trust. Innovation requires a space for risk-taking and mistakes. Inquiry requires slowing down learning to encourage curiosity and allow students to develop questions, collect data and perspectives, and understand what action can be taken. Paul's curriculum was very open-ended; he began with the students' ideas and structured learning opportunities around their interests. The kindergarten class exercise needed to happen at a pace that allowed extensive discussion and moments for students to sit and think about the critical issues in the text—and feel safe to express a range of perspectives. Acknowledge the diversity of experiences and opinions. When we examined the ways in which teachers were empowered to foster critical dialogue, we noted that not all teachers shared the same values, beliefs, or goals for civic engagement activities. It's the intersection of beliefs, lived experiences, and contexts that fosters conditions in which citizens seek to improve their own and others' life conditions. Adults and young people coming together to reflect on Kaden's research didn't result in one opinion about the issue or even a resolution on the topic, but Kaden's use of data swayed the tenure of the "talk" about the issue going forward. Support teachers to be advocates of critical dialogue. Administrators should demonstrate support for such activities and provide coaching for teachers and students when needed. Learning to foster such dialogue takes practice and intention. For instance, Paul had received extensive training in his previous work with student voice groups before becoming a middle school teacher. Teachers might need to seek out support mechanisms and networks of practitioners working on critical dialogue (Mitra, 2009). Our research has shown that when doing critical dialogue, it's important to help students notice injustices connected to persistent inequities of race, class, and gender. Effective critical dialogue doesn't leave the privileged kids ever more privileged to have a voice; it equips students to talk across differences. At a time when opportunities for such conversation are shrinking in our society, it's more important than ever to intentionally teach young people to engage in critical dialogue. Dockett, S., & Perry, B. (2005). Researching with children: Insights from the starting school research project. Early Child Development and Care, 175(6), 507–521. Fitchett, P. G., & Heafner, T. L. (2010). A national perspective on the effects of high-stakes testing and standardization on elementary social studies marginalization. Theory and Research in Social Education, 38(1), 298–316. Hoffman, M. L. (2001). Empathy and moral development: Implications for caring and justice. Cambridge, England: Cambridge University Press. Levinson, M. (2012). No citizen left behind. Cambridge, MA: Harvard University Press. McIntyre, D., & Rudduck, J. (2007). Improving learning through consulting pupil. New York: Routledge. Mitra, D. L. (2008). Student voice in school reform: Building youth-adult partnerships that strengthen schools and empower youth. Albany, NY: State University of New York Press. Mitra, D. L. (2007). The role of administrators in enabling youth-adult partnerships in schools. NASSP Bulletin, 91(3), 237–256. Mitra, D. L. (2009). The role of intermediary organizations in sustaining student voice initiatives. Teachers College Record, 111(7), 1834–1868. Mitra, D., & Serriere, S. (2015). 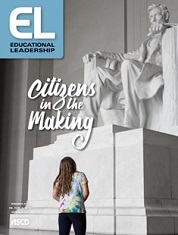 Civic education in the elementary grades: Promoting engagement in an era of accountability. New York: Teachers College Press. Osler, A., & Starkey, H. (2005). Changing citizenship: Democracy and inclusion in education. London, England: Open University Press. Serriere, S., Burroughs, M, & Mitra, D. (2017). Kindergartners and philosophical dialogue: Supporting child agency in the classroom. Social Studies and the Young Learner, 29(4), 8–12. 1 These cases are described more thoroughly in our article "Kindergartners and philosophical dialogue: Supporting child agency in the classroom" in Social Studies and the Young Learner. 2 In this example, names of the school and students are pseudonyms. Dana Mitra is professor in the Department of Education Policy Studies at The Pennsylvania State University. Stephanie Serriere is associate professor of elementary social studies at the School of Education, Indiana University-Purdue University Columbus. They are coauthors of Civic Education in the Elementary Grades (Teachers College Press, 2015). Michael Burroughs is director of the Kegley Institute and assistant professor of philosophy at California State University, Bakersfield. He is coauthor of Philosophy in Education: Questioning and Dialogue in Schools (Rowman & Littlefield, 2016).